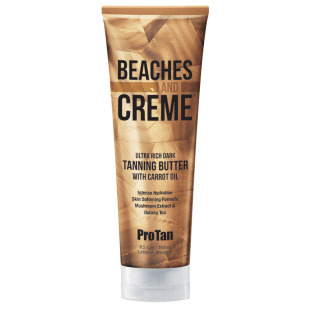 Dark Intensifying blend with Tyrosine helps promote melanin production for a natural, darker looking tan. Carrot Root Oil helps provide extraordinary skin nourishment and soothing properties. Oolong Tea and Mushroom Extract help to brighten, improve color and provide the ultimate in skin conditioning. Deeply moisturize and nourish skin while achieving your desired tanning results with this creamy, rich body butter. 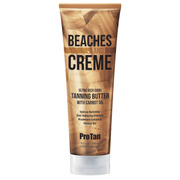 Beaches and Crème Ultra Dark Tanning Butter is enriched with Carrot Root Oil, a powerful tonic that contains high levels of Vitamin A that helps to nurture and give skin a revitalized fresh glow. Antioxidant rich Oolong Tea, skin conditioning Shea Butter and nature’s best moisturizing ingredient Mushroom Extracts help to provide maximum skin hydration, feel the difference.